We’re bouncing. Up, down, up, down. 130 participants. Up, down, up, down. That feels weird, probably because it’s unusual. As an adult you don’t jump very often, at a conference actually never. But at the end of our annual conference, the betterplace labtogether, it was simply good to shake body and mind one last time. We didn’t want to hold an ordinary conference anyway. We didn’t want to sit around for many hours just to end up going home with the same opinion that we had come with. Our goal was to experience New Work as Inner Work. But how can you do that? In the course of the betterplace lab Team Transformers — our own journey towards self-organisation and “evolutionary purpose” — it had become clear that one could endlessly reflect on the topic in theory, but that it was something completely different to experience New Work at first hand. What does it do to us as human beings when we suddenly have much fewer structures and more freedom, but also more responsibility? What does it mean to appear as a “whole person” in a team? What happens when we negotiate our own salary with colleagues? And how do we protect ourselves from stress and overwork and increase our inner well-being at work? How does New Work feel? We wanted to explore these topics holistically, i.e. physically, emotionally and intellectually. To prepare ourselves for this, we started with a meditation on “John Cage 4'33”. The rest of the conference was very interactive. The first round of workshops focused on individuals and employees, while in the second round we looked at our companies and organisations. We need to practice new social practices. That’s what we did today: empathic listening, moments of silence. And you can do that even if you’re not a leader; just take it along and try it out, just see what it does to a team or organization. In workshops, participants explored how we can develop new roles and processes that are more adequately adapted to human needs, diversity, innovation and complexity. Our focus was on the internal, socio-psychological maturation processes that we have to go through in order to successfully and sustainably put the new structures into practice. Which competencies are included in this development process and how can they be learned and strengthened? Which digital tools can support this? Besides short inputs, the participants themselves had a lot to say in these sessions and explored their individual needs and interests in triads. The topic of wellbeing was also very well received, as high levels of stress, trauma and precarious working conditions are frighteningly widespread among social entrepreneurs. Matthias Scheffelmeier of Ashoka and I presented the Wellbeing Project in a workshop (I have been blogging about the project here). Social entrepreneur Ralf Sange, participant of the Wellbeing Project, reported from his perspective how important internal work, selfcare and open communication are for his personal development and that of his company Gründer 50plus. In the small groups that followed, it became clear how much resonance the topic created and how important it is to include individual factors and strategies as well as to look at the systemic facets. Many participants were visibly touched to be addressed in such an intimate way at a public conference and to be able to show themselves in a more holistic way. We know that in the lab. 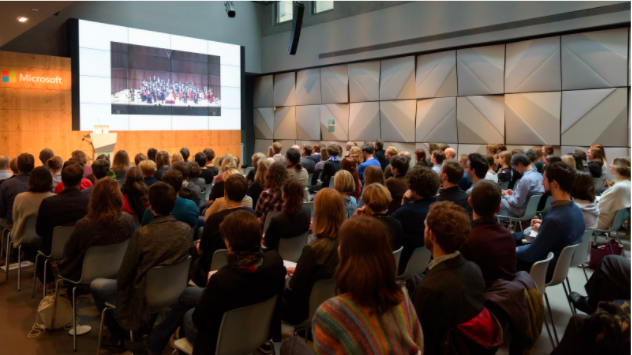 Every year, we are wondering whether we can and want to set up another labtogether conference. There are good reasons for it (fun, we are super down for the topics and people, our impact and its a tradition) and against it (effort, costs, enough impact?, only a tradition?). What did the labtogether cost? Ultimately, our curiosity has won and the ambition to finish a labtogether for the first time in its six-year history with a small margin. 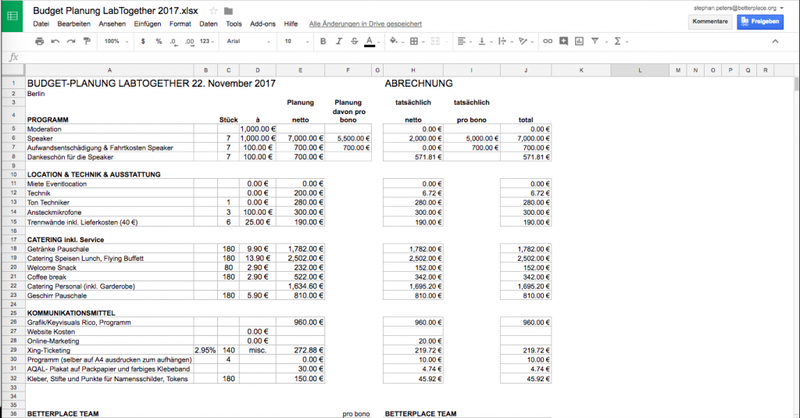 And a look at our accounts shows (thanks to Open Bookkeeping): We have made it and thanks to our sponsors, paying participants and some pro bono services we have generated an impressive 2,221.58 euros. We also had the opportunity to try out how it works if you make all costs transparent and can have a serious discussion about whether this event is worthwhile — and not only financially. And, did the participants like it too? Altogether we filled the Microsoft Eatery with 130 participants — probably a little crowded, so that it sometimes became too loud in the workshops and sometimes not fast enough at the Flying Buffet. An empty stomach and booming ears are by no means the best ingredients if you want to treat yourself and others with care. Sorry! The fact that the participants were nevertheless enthusiastic was mainly due to the topic, the speakers, the formats and the exchange. Our feedback survey reflects this. The topic was a direct hit. Many people are concerned about how they work and how their needs can be reconciled with the high demands of an increasingly complex and faster world. Unfortunately, the answers are not off the peg, everyone has to find them for themselves — for example in the different formats of the labtogether. Of course, this requires the common will of all those involved. The answers are new, the paths are new. To go nevertheless needs said courage and energy or “spirit”. 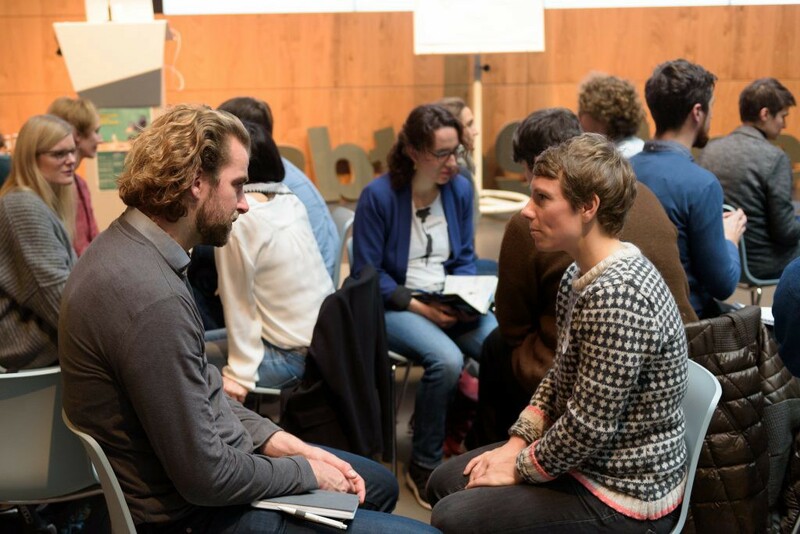 Perhaps this was the greatest recipe for success at this year’s labtogether: many people, be they participants or speakers, facilitators and organizers, who got involved and wanted to co-create something new. In this atmosphere new experiences were possible, which hopefully will last.